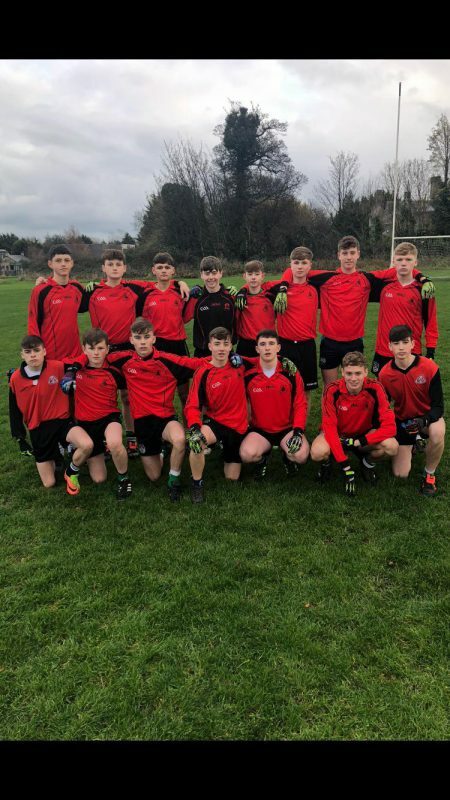 Lucan CC under 16 Gaelic footballers advanced to a semi final meeting with Blackrock College after a comprehensive victory over a gallant Lusk CC side. From the first whistle,Lucan forwards Luke Curran,Jack Lawlor and Paul Tuite were causing untold damage to the Lusk rearguard and Lucan had a half time lead of 4-7 to 2-5. 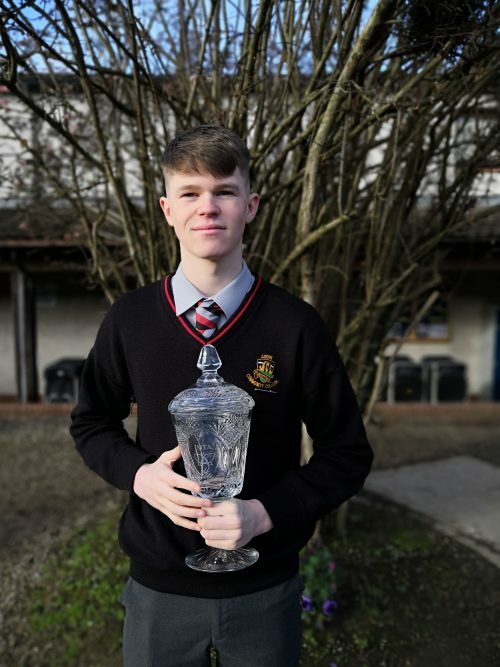 Lusk came roaring out of the blocks in the second half and scored 1-3 unanswered but soon after Lucan’s defence tightened up and scores from Jack Lawlor and Luke Curran again extended Lucan’s lead and the lads pushed on in the final 15 mins to record a hugely impressive 11 point victory. At the beginning of the football season the Lucan CC senior girls soccer team were knocked out of the cup by Loreto Mullingar losing 3-2. On that day many excuses could have been made – injuries, lack of training time together, a long distance journey or the harsh conditions of rain and hailstones. However, nobody made an excuse. The opposition played in the same conditions and injuries are part and parcel of the game. As Pep Guardiola stated ‘excuses mean you cannot grow or move forward’. 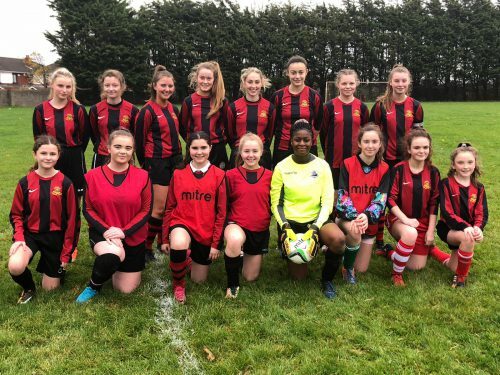 On April 1st, the Lucan CC senior girls soccer team set off to again face Loreto Mullingar aiming to secure a spot in the Leinster division 1 semi-finals. The conditions were excellent. The team were pumped. They wouldn’t be leaving Mullingar this time without a victory. The game started off well for Lucan with some nice tidy passes between the midfield trio of Emma Fallon, Aoife Hanley and Amy Green. 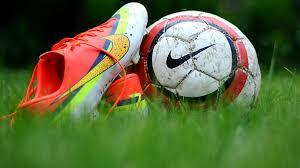 Possession was the aim of the game and to play the killer through ball at the precise moment. It wasn’t long before the deadlock was broken. As the ball fall to centre-back Zara Lawless she played an exquisite, Bonucci like diagonal ball to Nicole Smyth whose first touch and pace took through 1-1 with the keeper. Calmness personified, 1-0 Lucan. The game was far from over. Lucan CC were in this position before against this same team. Mullingar pushed forward in search of an equaliser. It was time to absorb some pressure and hit them on the counter attack. In recent seasons, counter attacking football has been utilised to great success by many teams: Spurs, Wolves, Chelsea. The key is to break quick and precision passing. The next goal was an example of how counter attacking football should be played. Aoife Hanley picked the ball up outside the box, turn, head up, and played the perfect through ball, one Andrea Pirlo would be proud of, splitting the defence for Nicole Smyth to again run through and slot home. 2-0 Lucan. At half time two changes were made due to injury. It was a battle. 5 minutes into the second half another injury. This time Sarah Winders unfortunately taken out from behind. The opposition player receiving a yellow for what many would argue was a straight red offence. From the resulting free kick Zara Lawless narrowly fired wide. Soon after, Loreto Mullingar pulled a goal back. They were in the ascendency. 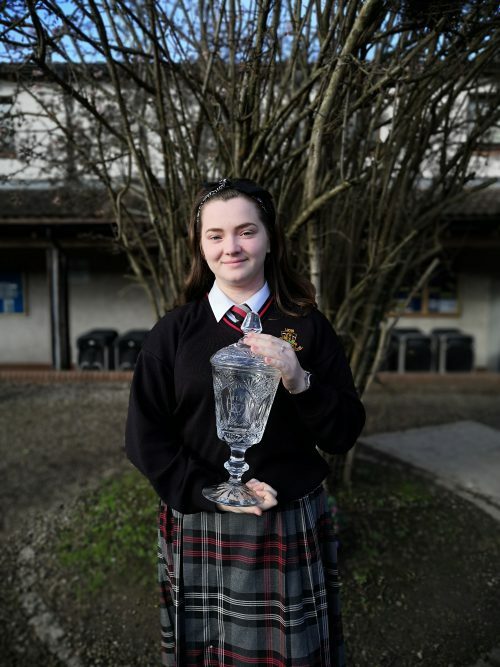 It was time to dig deep for the Lucan girls and dig deep they did. Bodies were on the line making sure the ball didn’t reach the back of the net. Time felt like it stopped. As the closing moments came, Mullingar had a player sent off for a shoulder barge in to the chest of Emma Fallon. A second yellow. 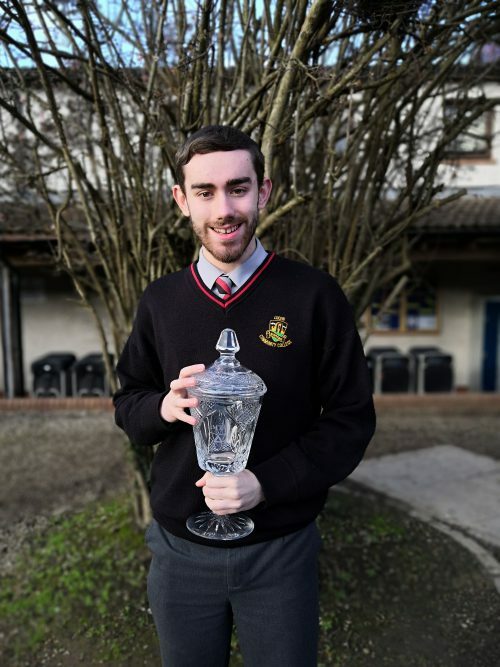 Loreto Mullingar down to 10. Lucan CC held out for a well deserved victory and now face St. Mary’s Naas in the semi-final, the furthest a senior girls soccer team from Lucan CC have gotten in 20+ years. It’s hard to beat someone who never quits and Lucan CC girls soccer teams never quit. In September 2011 Richard Dunne put in one of Ireland’s greatest ever defensive performances against Russia to help Ireland clinch a place in the Euro 2012 play-offs. Today, Ana Gayubo Kinch put in one of Lucan CC’s greatest ever defensive performances, reminiscent of Dunne’s, to ensure the U15 soccer team secured a place in the U15 girls Leinster division 1 quarter finals. The game started off slow for Lucan with Loreto Bray taking an early lead though a stunning strike. The long journey potentially resulting in some tired legs. But soon after conceding the early goal the team jolted in to action. The side created many chances though the wide channels with Leah Finn and Emily O’Reilly supplying balls to the onrushing attackers who were thwarted on numerous occasions by a fantastic goalkeeping display. Eventually Lucan levelled the scoring with a strike from Amy Green, who dominated the midfield for Lucan, meaning the sides went in level at half time. A big push was needed in the second half with Allana Dunne coming off the bench to provide some energy. The side continued to push for the second goal but again were denied on numerous occasions by the Loreto Bray ‘keeper. The tension was building as the clocked ticked on. The rain began to pour creating a cinematic moment. A goal was coming. With 13 minutes left to play, the captain, Clodagh McDonnell, won the ball back in the midfield, strode forward with pace and power… past one…past two…three…FOUR….GOAL! 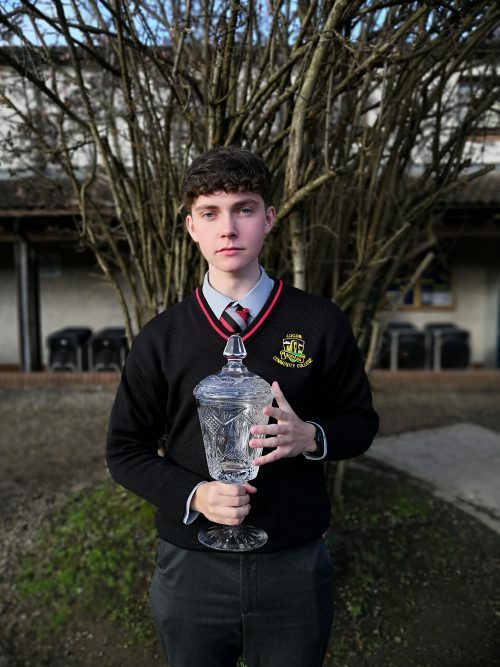 A moment of true individual skill that ultimately secured Lucan’s place in the quarter finals. Lucan CC had an impressive win over Scoil Caitriona in the quarter final of the Dublin league and will now advance into the semi final. 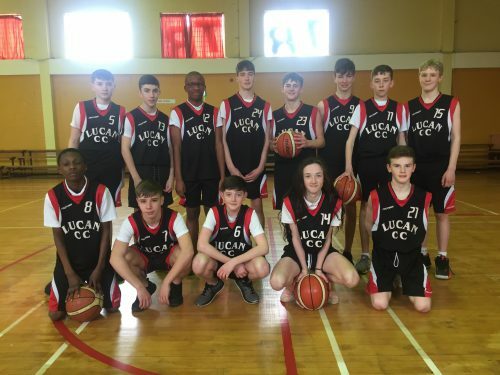 Lucan narrowly defeated their opponents by 3 points in the end. Every player encouraged one and other and it was a real team effort. 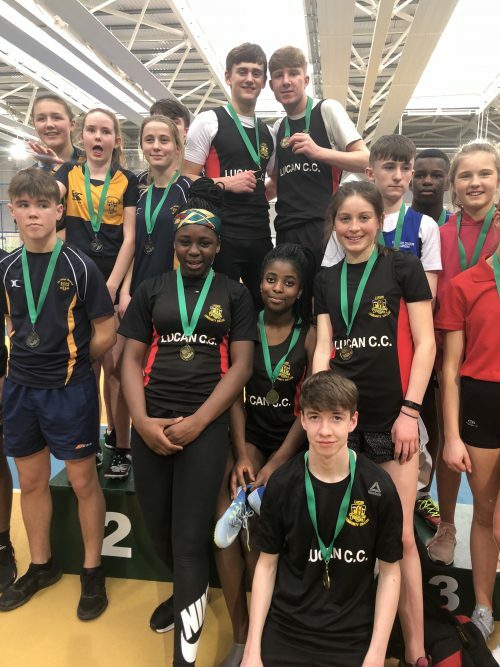 Lucan CC brought 28 1st & 2nd students to this massive competition which took place in Abbottstown’s beautiful indoor 200m track. 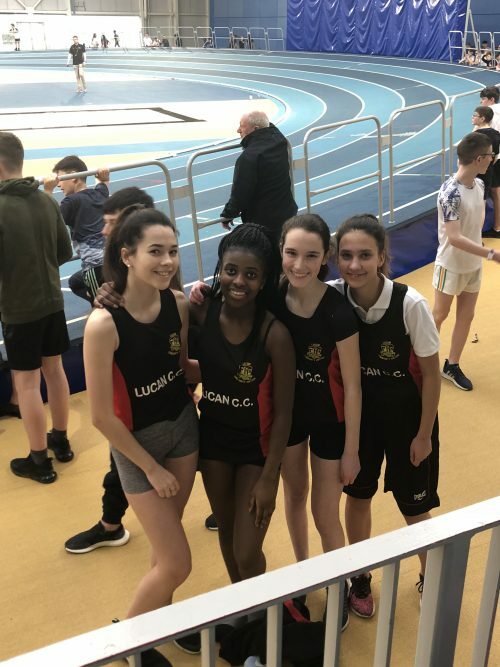 All of our athletes did Lucan proud sprinting, throwing and jumping. We stormed to success and took home several medals for all our hard work. 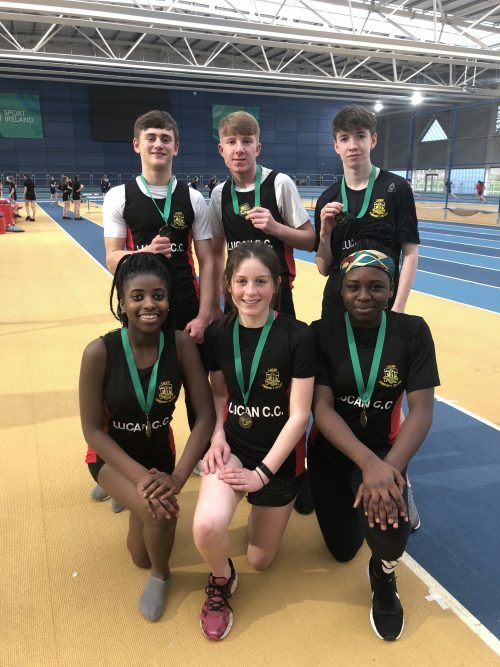 Our mixed relay team consisting of Alex Geissel, Gerard Gorman, Dara Donoghue, Milly Hughes, Ago Salawu and Ashley Kam claimed the top prize of a gold medal. They ran an unbelievable race and worked together to claim that top spot. 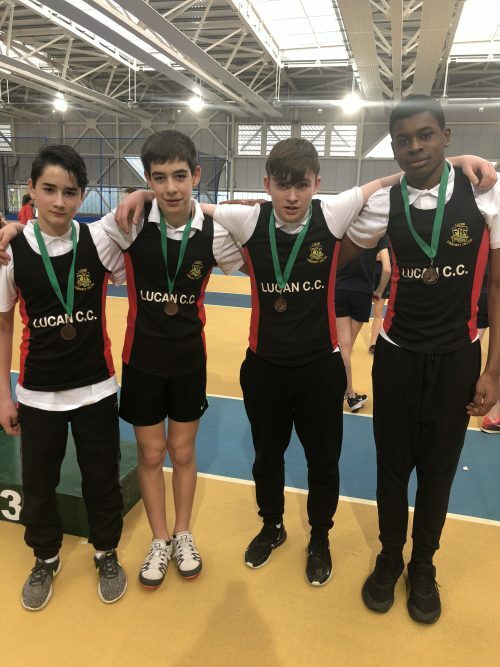 Our 1st year boys relay team consisting of Llyod Gysai, Eoghan O’Connor, Ben McLoughlin and Thomas Jermain won their heat and booked their spot in the final. Once again they ran so well and were deserving winners of their 3rd place and got the bronze medal. In the individual events Alex Geissel made the Long Jump Final and placed 3rd getting himself another bronze medal. This was a highly contested competition with over 150 participants. 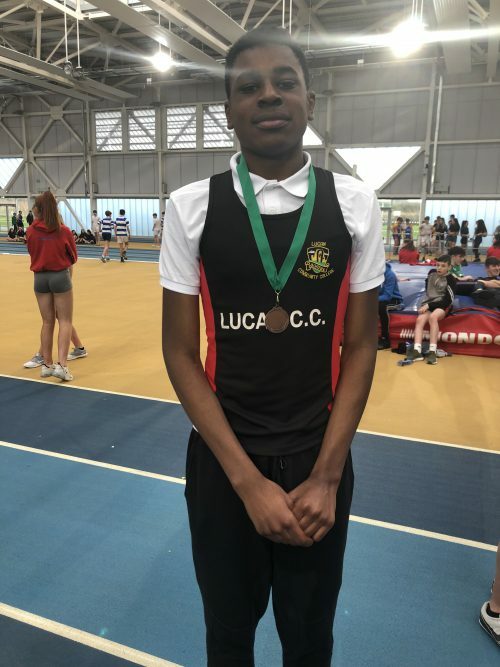 Our very own Llyod Gysai won his 60m sprint and also won his semi-final and then came from the back in the final to claim himself another bronze medal. 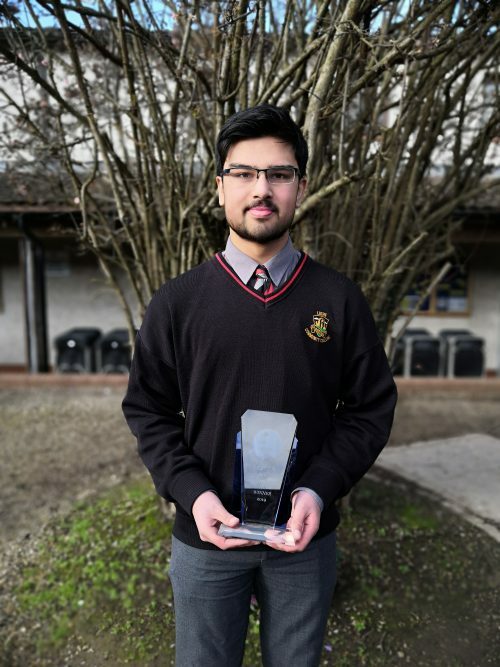 This was a fantastic achievement for all our students. Well done everyone! 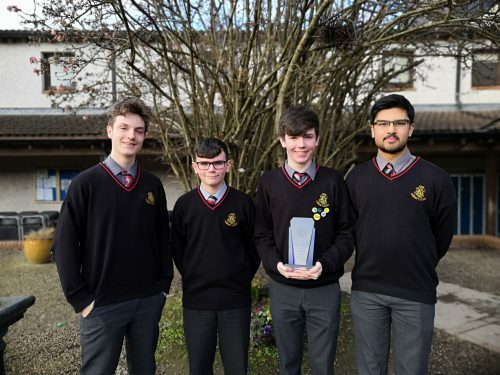 Congratulations to our Junior Maths Team, students Ronak Pathak, David Wright, Fintan Buckley, and Charlie O’Malley, on their fantastic victory in the regional IAMTA Problem-Solving Quiz. 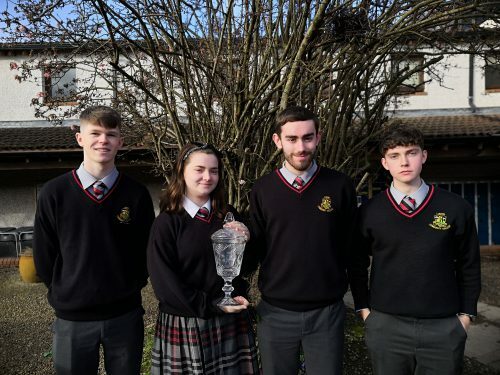 The Lucan Community College team took gold in the prestigious Maths Quiz in Patrician Secondary School in Newbridge last week. They will now go on to represent the school in the National Final on 23 March. We wish them every success as they prepare for the national final! We thanks their Maths teachers and Ms Suttle for all their hard work in helping the team prepare for the competition. 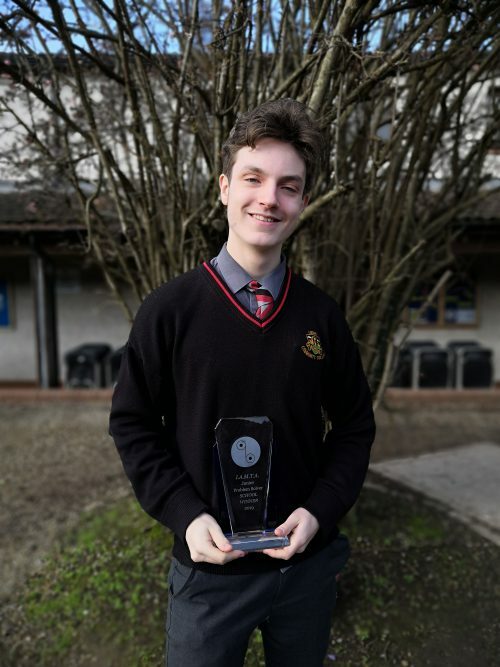 On Friday 25th of January two teams of four Leaving Cert students from Lucan Community College competed in the Dublin region round of the annual Team Math competition in Rathdown School, Glenageary. This competition has been run by the Irish Maths Teacher’s Association since 1991. This year 48 teams from many different schools in Dublin and the wider area participated. 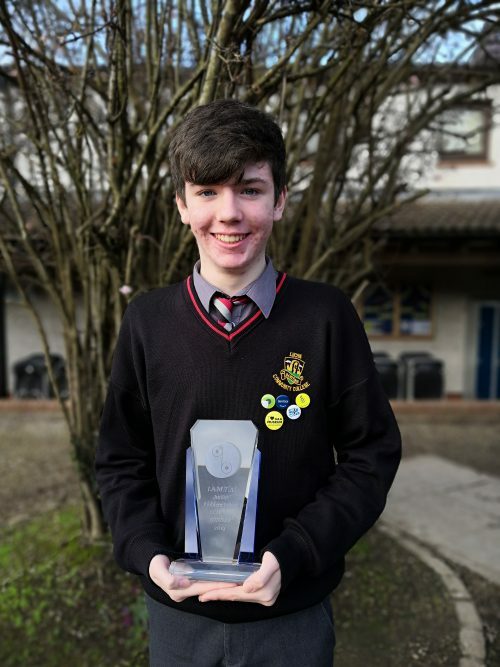 The competition is composed of 8 rounds of challenging questions based on the Leaving Cert higher level course. We have competed in this competition for many years but this year is the first year we have been victorious. 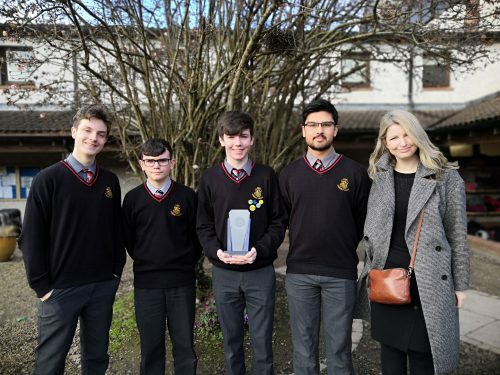 We are so proud of our senior Maths A team of Alex Hanley, Luke Neville, Oisίn O’Sullivan and Petra O’Connor. 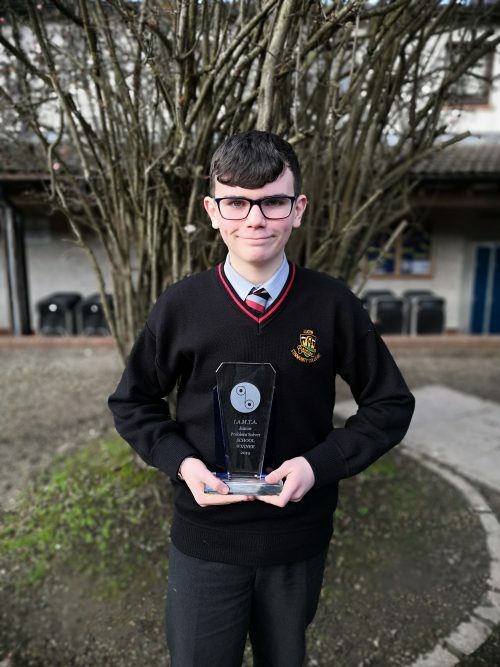 The team held off serious competition from the other schools including Sandford Park, Gonzaga College, Confey Community College, St. Gerard’s, Bray, St. Wolston’s, Celbridge amongst others and in doing so won the Dublin region competition outright. The victorious Lucan CC team now progress to the national finals in Maynooth on Saturday 2nd of March. Well done also to our second team of Kevin Wang, Killian Lyons, Przemek Majda and Rίan Porter who performed brilliantly too. 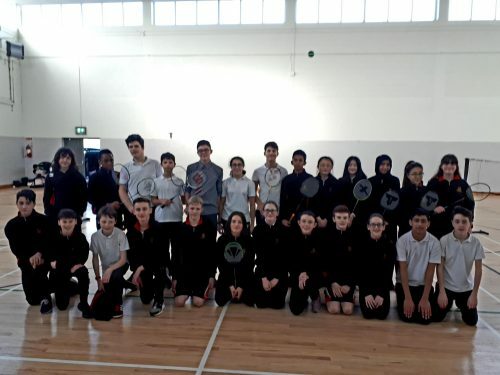 Lucan Community College performed brilliantly at the Badminton Blitz held in Lucan Leisure Centre this week. The 2nd year team won, 14 games to 6 with some very skillful shots but the 1st year team never gave up and improved with every game played. One of the great modern Premier League quotes questions if teams ‘can do it on a cold rainy night in Stoke’? Although not Stoke, our girls senior soccer team showed that they have the ability to play attractive, attacking football in all conditions as they ran out 10-1 winners on a cold, rainy morning in Lucan over local rivals Adamstown CC. The girls got off to the best possible start as Nicole Smyth put the team 1-0 up inside the first few minutes. It wasn’t long until Nicole added to her tally as she netted a hat-trick in the first half and added 1 more in the second, not be outdone by Katie O’Connor who also secured a hat-trick for herself. Many more chances came our way, yet the Adamstown goalkeeper made save after save to keep the scoreline down alongside some last ditch tackles from their defence. Despite this, our side finished the 1st half 6-0 up after Clodagh McDonnell scored right before half time. The midfield was expertly marshalled by Emma Fallon who broke down numerous Adamstown attacks and provided the defensive nous that allowed the strikers and wingers freedom to express themselves. Her driving run and drilled effort in the second half was saved but fell kindly to Jessica Power who stuck the ball in the back of the net. Although Adamstown pulled one back, Zara Lawless scored to bring her tally to 3 goals in 2 games from centre back. The girls go again on Friday as they face off against fierce rivals St. Joseph’s College and hope to make it 3 wins from 3 this season. The senior girls soccer team kick started their season with an excellent win and performance against Maynooth Post Primary. Nicole Smyth captained the side to a 7-0 win scoring two goals in the process. 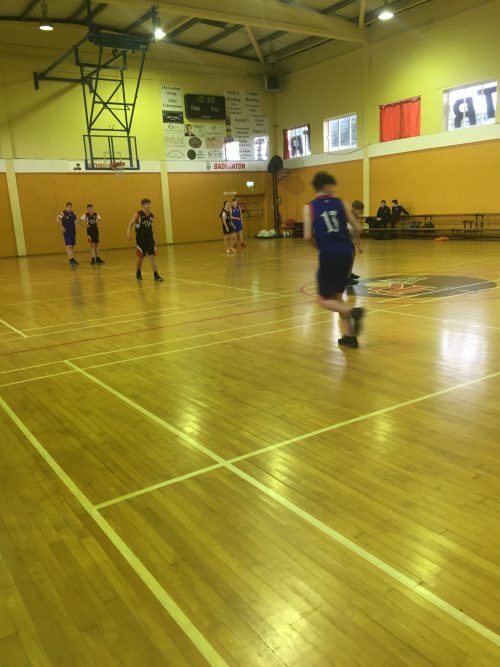 Although the result suggests otherwise, it was a hard fought battle with Maynooth Post Primary having chances of their own as they hit the crossbar in the second half and were also denied by a string of excellent saves by goalkeeper Ingrid Tientcheu. Overall, the hard work, skill and determination of the girls paid off as they slotted home 5 goals in the second half. Special mention must go to the goalscorers Nicole Smyth, Zara Lawless, Carah McLoughlin, Aoife Hanley and Amy Green and to 1st year student Sarah-Kate Winders who made her first appearance in the red and black of Lucan Community College. 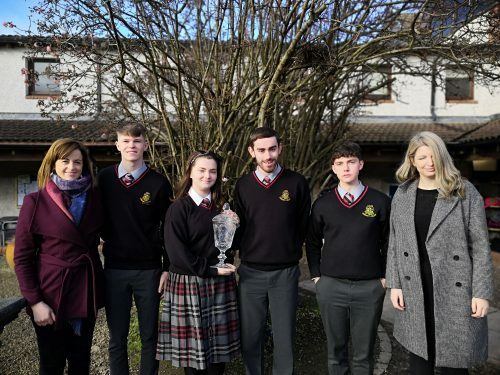 Well done to the team who embody all that we aim to achieve here at Lucan Community College. The next match takes place next week against our neighbouring school, Adamstown CC.